The Crystal LED Acrylic Display is super-slim, the thickness is only 8-10mm. The light source is high light and less aging SMD LED, it is energy saving and has a longer lifespan. The working power is 12V - it is more safe. The Acrylic Display is nice and beautiful for outlook. Easily change pictures through the screws. Laser engraved LGP with even brightness and less aging for the Light box. Hang on the wall, etc. 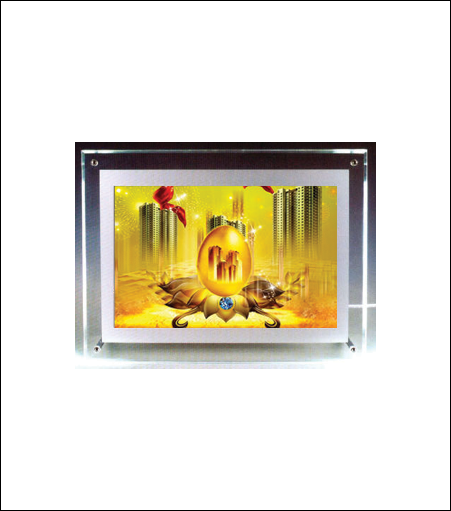 These are widely used for advertisement in business centers, cafes, bars, supermarkets, banks, chain operation stores, restaurants, airports, shop windows, etc.